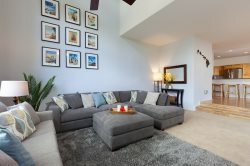 1005 Waikoloa Colony Villa is the perfect place for creating family memories, and features three bedrooms, two full plus one half bathrooms, and accommodates up to six guests. You and your guests will enjoy the white sandy beaches of close by Anaehoomalu Bay (A-Bay), which is a great location to snorkel, swim, paddle, sail or just relax on the beach under beautiful palm trees. Your condo is decorated in the “Hawaii Island” style. The main level includes the kitchen, dining room, living room, and lanai just off the dining room and living room. Enjoy the scenic view of the 10th hole of the Waikoloa Beach Golf Course that you see from the windows or while relaxing on the spacious lanai. A combined living, dining and kitchen area occupies the entire entry-level floor. There is a spacious dining table for six people, as well as bar stools along the breakfast bar, where guests can gather to discuss the day´s adventures! The outdoor dining area seats four and has views of the golf course. All three bedrooms are located on the upper level, and the master suite provides a private balcony with beautiful scenic views of the surrounding landscape. The master features a cozy king-sized bed, a large walk-in closet, and a spacious bathroom with double sinks and separate tub and walk-in shower. Two additional bedrooms (one with a queen bed, one with 2 twin beds) are on the second floor along with a second full bathroom. The guest bedroom with the queen bed offers a Medi Pedic Collection mattress. This is a more 'firm' mattress. It has a pillow top to provide extra comfort. Also on the second level is a full-sized washer and dryer. All bedrooms have ceiling fans. For the golfers in your family there are two beautiful championship golf courses in the Waikoloa Beach resort, The Beach Course and The King’s Course. Just north of Waikoloa Beach are two additional resorts with championship caliber gold courses, The Mauna Lani Resort and The Mauna Kea Resort.The Waikoloa Beach Resort has two shopping malls. The Kings’ Shops and The Queens’ Market Place. Each offers unique shopping, dining, grocery, services, and entertainment. Our stay at the condo was absolutely amazing. The property was beautiful as was the condo. My kids loved swimming at the pool, we loved to barbecue at the pool and my parents loved to sit in the hot tub! We will definitely plan on coming back to this exact location! It was our first visit to Hawaii and the decor of the condo, the beautiful scenery of the mountains on one side and the beach on the other, breath taking! A wonderful place to relax and enjoy the scenery, or close enough to tourist sites by car. A wonderful vacation experience! The Resortica staff is top notch. It was very nice having free Wi-Fi in the condo, as our T-Mobile phones and data were very spotty when we were sight-seeing on the island. We put our phones on Wi-Fi, and we were always good to go in the condo. We also had a laptop with us, and we used it every day without fail. The condo is beautiful and the Big Island is wonderful. I would definitely recommend this unit to anyone wanting to visit Hawaii. Pros: We enjoyed our stay at the Waikoloa Colony Villa (1005). The interior condo was welcoming, spacious and clean. It had lots of amenities provided already i.e. ; blow dryer, kitchen utensils, laundry, etc. Con: wifi wasn't consistent on the usage. It comes and goes, but mostly goes. The internet needed to be re-configured. The service technician showed up immediately, fixed it rapidly and was very friendly. We were delighted that everything was in perfect shape. The house and the kitchen are extremely well equipped. Overall one of the best vacation rentals we have been in so far. Spacious rooms, nice quiet Location. Sitting outside in the evening is a highlight: nice Spot surrounded by plants. The Location is very Family friendly, our Kids enjoyed playing on the large meadow adjacent to the house!